We have just returned from a great two-month long summer vacation up north, where we attended reunions and tried to find cooler temperatures than Arizona, sometimes in vain. It was often hotter where we were than back home in Tucson! It was great to get away though. While vacationing, I was fortunate to be able to take some time out for visits with a couple of our more experienced builders. Gary Rene and Dave Melby kindly let me stop by their shops for short visits and some picture taking. All I can say is that I was really impressed! Our first stop was at Gary's garage, where his extremely well done Celerity project looks like it might be 90 per cent completed. It basically lacks paint and minor items. Over the past year Gary has completed fabricating his engine cowling and completed much of the cockpit work including a beautiful instrument panel installation. 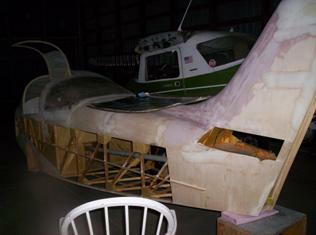 The airframe is presently almost ready for paint. First to catch my eye was Gary's composite Q-Tip prop from Prince Aircraft Co. (Ph. 479- 877-5557). All black and shiny, this propeller will really do the job of translating all 180 hp in his Aero Sport engine to short takeoffs, great climb rates, and high cruise speeds! We surely look forward to getting the performance figures back on this engine and prop combination. You can contact Aero Sport Power in BC, Canada, at 250-376-2955. Aero Sport Power O-360 engine, as installed in Gary Rene's fixed gear Celerity. 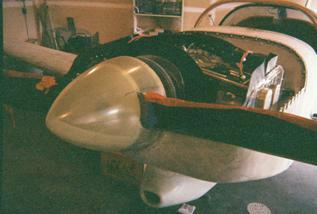 Note the cowling fastener system. Gary's cowling is made in just two pieces, top and bottom. It fastens to the fuselage and along the lateral joints using high quality countersink type fasteners. 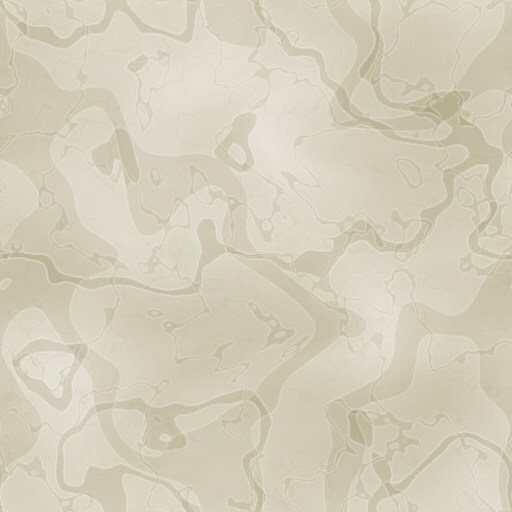 The firewall is stainless steel and it has VERY FEW penetrations, the mark of an extremely well executed installation. Block sanding of Gary's Celerity is complete except for cowling touch-up, so it won't be long before paint colors and layout can be chosen. Gary's panel has an EFIS primary display with backups as needed. It is a really clean, attractive panel, fabricated by SteinAir, Inc. of Farmington, MN. (Ph. 877-282-8996). The fuel selector and individual (not two-in- one) fuel quantity gauges are sensibly laid out for easy interpretation. This is a very important consideration for those occasions when you are busy in the cockpit with bad weather, darkness or other problems. 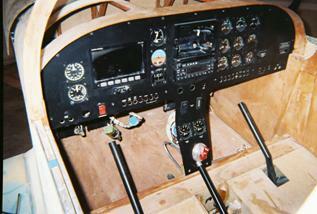 Gary Rene's instrument panel with EFIS and "steam gauge" backups as needed. Note the two individual fuel gauges and fuel tank selector just above the flap handle. This brings up an important point in aircraft design and construction. Since one of the leading causes of aircraft mishaps is fuel starvation EVEN THOUGH THERE IS AMPLE FUEL ON BOARD, you need to think carefully about your fuel selector and gauge layout like Gary did when you build your airplane. After all, the big three U.S. airplane manufacturers have all gotten it wrong in the past. They have been guilty of locating fuel selectors far away from the gauges, sometimes in odd places where they are not even visible to the pilot! The operation of their fuel selectors may not be intuitive either, especially if the pilot is under pressure. I know that this can be a real problem. A few years back, a business acquaintance of mine phoned me with details of his recent plane crash. He was a relatively new, but serious and otherwise careful pilot, and he had sadly cracked up his friend's airplane due to fuel selector confusion while under pressure. 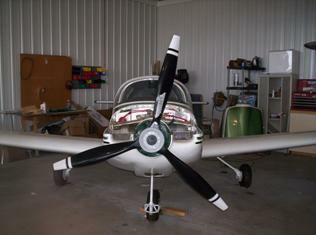 My friend was transitioning from a high-wing gravity fed Cessna fuel system (fuel "on" or "off") to a low wing Piper. 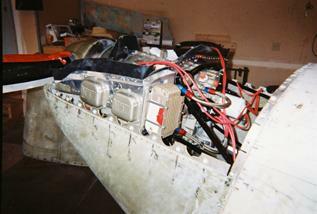 The Arrow had its gauges up on the instrument panel and the "left" or "right" fuel tank selector was mounted down low on the forward sidewall of the fuselage. His checkout in the aircraft apparently did not cover the fuel selector and he was too low and slow to figure it all out before the aircraft came down on rough terrain. Fortunately he walked away, but the damage to his friend's Arrow was extensive. I have owned all three types of the offending aircraft (i.e.-two Beechcrafts, two Cessnas, and a Piper Cherokee, among others), and to my way of thinking none of them had a truly sensible fuel gauge and selector layout like Gary's Celerity has. Enough said! Some of you may recall that Dave Melby was a fellow Cavalier builder along with Celerity designer Larry Burton. In the early days of Mirage Aircraft, Dave and Larry, assisted by Bruce Boylan, had together constructed the Celerity prototype. The three also partnered to initially market the plans for the Celerity design in the mid-1980's. 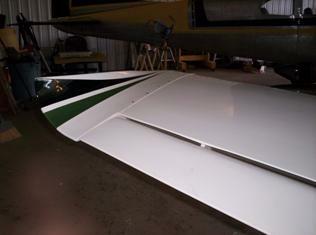 In addition to his Cavalier, Dave Melby also formerly completed building a Celerity fuselage, with very good workmanship I might add. This fuselage is currently owned by Don O'Rourke. Dave Melby's Cavalier-the cowling top is standing behind the wing at the right. You may have seen a Cavalier before, but it is doubtful that you would have seen one as nice as Dave Melby's! I never saw it before its recent rebuild and renovation, but I can tell you that today it is one beautiful airplane! No matter what angle you look at it, Dave's Cavalier shows a great deal of care and attention to detail. It is professional looking through and through. 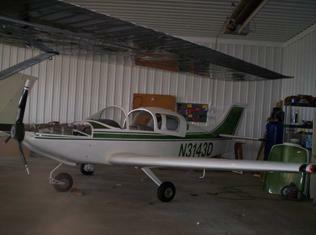 Dave has used the fiberglass main gear legs from a Grumman for his Cavalier. He has also made his wing tips in an upswept configuration "just for looks." From what I have read about wing tips they can be all kinds of shapes, from Mooney's square cut-off style to rounded tips, from drooping to upswept, and so on. Upswept wing tips lend Dave Melby's Cavalier an air of class. One shape you don't want to guess at though is the shape of the prop. Dave has built his own wood three-blade fixed pitch propeller, a thing of great beauty. Fortunately he already had some experience with this challenging task, having built a similar prop before this one. At any rate the propeller looks like it was built by a master craftsman, a term that fits Dave well. Of course, his lengthy career in that other "homebuilding" arena, building houses up til his recent retirement, is great background for someone undertaking such a task. Note that the skin on the Melby Cavalier is made of fiberglass over foam, unlike the original plans that called for fabric and plywood skin. This was the way that Larry Burton's Cavalier was finished, as well as his Celerity prototype. However, he's not necessarily wedded to fiberglass skin. 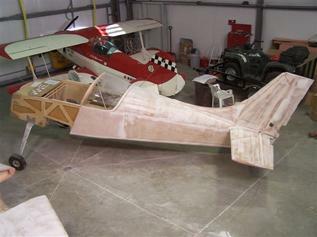 The fuselage of his newest project, a Cavalier hybrid, is shown below ready for the fabric to be applied over the wood and along the fuselage sides. Although the fabric skin is a return to the original plans, a few other design features are being modified on this aircraft to suit Dave's quest for simplicity. The light weight gull wing door is visible in the photo, but there are several other innovations also. We will cover some of Melby's design innovations in a later issue. Even though his project is not a Celerity or Marathon, it is of interest to nearly everyone who is building an airplane, no matter what their design. There's also his award winning Rand KR-2S, and the VW bug! Did we forget anything? Coming in October-Dave Christensen's Marathon TD = great workmanship! 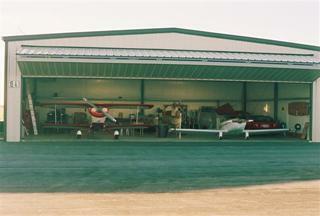 Dave Christensen's Marathon project, with his Acrosport biplane in the back.